I'd love to see NECA or somebody make figures based on the Original Jurassic Park, I love Alan Grant and Ian Malcolm. But I'll still grab these, even if they end up being subpar compared to original Kenner figures (which weren't even close to being screen accurate). I really don't care for the new Jurassic Park (world) stuff but will be all over the original film figures. I so want this T-rex. He is freaking awesome. If these figures are 3 3/4 inch, i might pick them up as well. From the blurry photo, they look like they have lots of joints. These look ok from the blurry photos. Would love a jp book line of figures. Ps... not baby dinos, looks like the compsognathus. 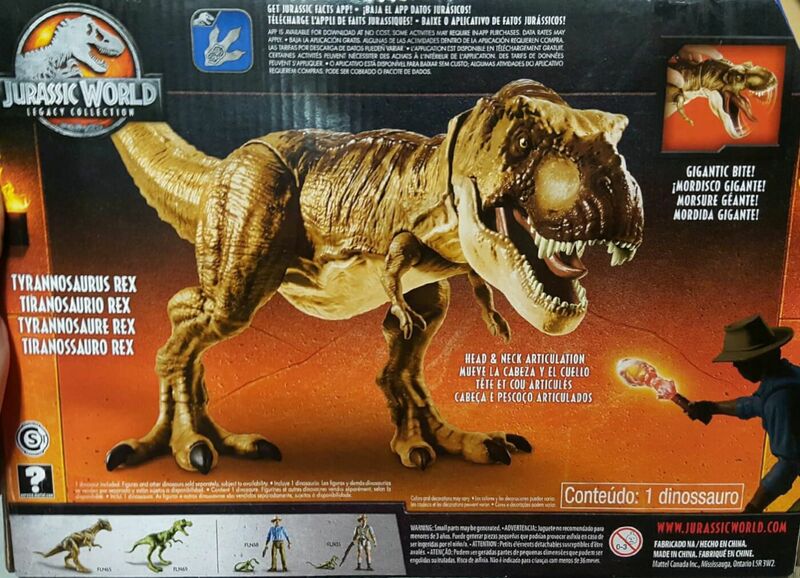 Smaller dinos are the jr trex from Lost World and Pachycephalosaurus “friar tuck” also from lost World. Last edited by webz; 03-23-2018 at 08:11 AM.. I'm interested in these as well. I'd love some high quality stuff from the first movie, but I guess I will settle for this. Hopefully they continue on with this. Gimme a Hammond (who I believe has never had a figure), Nedry, Tim, and Lex, too. Gimme a Lost World Malcom, Sarah, Kelly, Nick, and Eddie. Clever girl...um, I mean Mattel. Guess I'll be making a few trips to Target. I want a 3.75 version of the original Nedry figure. We're lucky the Kenner line wasn't just dinosaurs because the human characters were deemed too boring to be toys or something(since they weren't superheroes and didn't have extravagant looks/outfits). Well I'm glad they made them. The old JP toys were the ones I always took outside to play with. I had a few of them. Alan Grant, Ellie Sattler, the T-Rex, and a Raptor. The only one I still have is Ellie. But why it's limited to the US?! So annoying! If Mattle and Hasbro want to earn adult collector money, they need to start to move out of their comfort zone. Heck, even Bandai and Takara start to do so long ago. Last edited by Louise Belcher; 03-24-2018 at 10:54 AM..
Alan, Ellie, and Ian figures from the first film have been a harbored dream of mine for a very long time. Can't wait to pick these up!! It is just me or does it look like their hats come off? that would just be awesome if they do. I am pretty excited about these! Is there a release date? Kenner WAS Hasbro at the time jp toys were made. Kenner was completely absorbed into Hasbro and was just a banner Hasbro briefly used. My walmart put these out today. I bought the 3 foot T. rex. $49 great price,giant toy. I will hit up target to see if the 93 stuff is hitting yet. I'd read that Hasbro didn't shut down the Cincinnati offices of Kenner until 2000. So in spite of that, Kenner was no longer an autonomous company once Hasbro bought them, and Hasbro people were making all the decisions and designing the toys in the Kenner-branded lines?